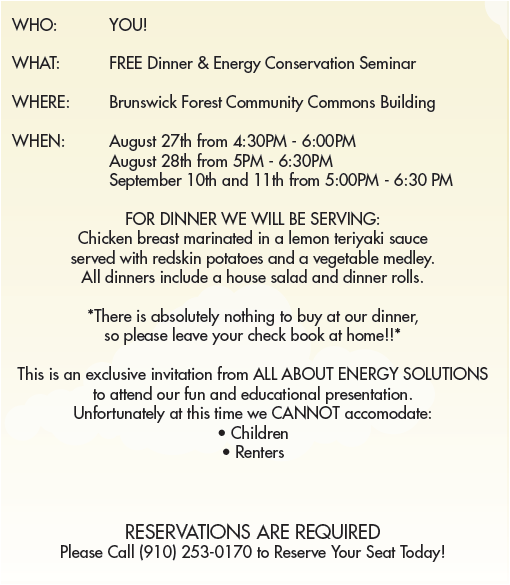 We are excited to offer our energy savings dinner seminars this week at the Brunswick Forest Community Commons Building. Join us for a FREE dinner and while you’re enjoying your meal, we will offer you tips to improve the energy efficiency in your home and save you money on your energy bill. There’s no catch, no strings attached and no purchase required, so leave your check books at home. If you’re interested in the tips and saving money on your energy bill, but can’t attend the dinner, give us a call today and we’ll come out to your home for FREE and provide you the same information during our energy audit. Give us a call and reserve your seat today! Older PostIs your attic too hot? Newer PostWhy Schedule a Free Energy Audit?